My name is Albertine Ahmadi and I was born and raised in an Iranian province by an Iranian father and European mother. I have lived in Europe since the 1970s and built a life in the West but have never forgotten my homeland (where my father is buried). I am a proud Iranian and a European citizen. I was studying in Europe at the time of the 1979 Revolution and now speak three languages, with degrees in economics, history and political science. As a dual national of nearly 40 years, I understand more than most how lucky I have been in studying, travelling and working in public and private sector jobs, while many of my countrywomen are treated like second-class citizens, or used as an alibi when it suits the Iranian regime. Contrary to most born into mixed marriages who prefer to be very discreet on their opinions about Iran and try to melt into the general mood by praising injudiciously all things Iranian/Persian when in the company of other Iranians, I speak up and am not afraid of expressing my thoughts. To speak clearly has not made me popular among many Iranians for two main reasons. First, despite their mild manners, the he-Iranian stays an exasperating chauvinist and the she-Iranian, especially when married, follows him suit to keep up appearances. As a forthright woman, no beating about the bush or uttering hollow Ta’arofs, I am usually rebuffed by a volley of polite sentences lacking logic and coherence. Otherwise, I am met with either a paternalistic and confused tirade of what I should know that everybody knows, or a disapproving frown followed by silence to put an end to the conversation. Worse is to come with the second reason: being a child of a mixed marriage, Iran-European, I am considered a “foreigner”, someone that does not understand the Iranian moods and cannot speak proper Farsi, as many do, with Tehran’s accent and expressions. In fact, I refuse to take up the artificial Tehran accent, which replaces most “a” vowels with “o” vowels in order to be in and chic . My accent comes from an Iranian province, as do most of my expressions, which are rooted in old languages, ready to evolve with time, rather than English/Latin terms transliterated into Farsi characters and then pronounced with a Tehran-i accent. I do not mind being taken as a pumpkin, or, as is commonly expressed in Iran to abase people with a provincial accent, a Dahâti . I care even less if I am treated as Bissavad / untaught by those who have learned a spoken homespun Farsi but are illiterate in it. I have been fortunate enough to live and work in six countries, but have developed a strong social conscience, sown in an Iranian remote rural province and later cultivated in Europe. When I could, I have professionally and personally helped refugees and people suffering times of crisis. By sharing their bread and salt where they were at the time, and listening to their stories, I have learned the hard way that any country in which the members of minority groups maintain their independent cultural traditions can move forward and evolve confidently. But it produces refugees. My mother’s country, a prude European democracy, harbouring many faiths and languages, unconditionally accepted me among its citizens. I became a pupil of secular democracy, learning to see things from different perspectives, in peace and security. For me, at first, it was hard to recognise and admit my own cultural differences, prejudices, and knee-jerk reactions. Now, it is a pleasure for me to listen to others’ opinions, express mine and try to find common ground. In my little European village where I live, I grasped the basics of the rule of the people for the people by talking to my neighbours, colleagues and total strangers: respect, tolerance, empathy, and dialogue. The foremost condition of any democracy lies in the willingness of people in having it as a political system and struggling for it. Then comes protecting it by recognising any alarming sign of despotism, however small, and standing up to it. In this process, religion has no positive role; it is a detriment; as it is the ethnocentrism that excludes others, and murders the merit and the worthiness of all citizens. Only a collective consciousness of social solidarity works for the better. This collective consciousness has to be cultivated by teaching and education from an early age. 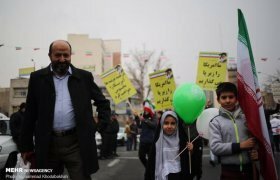 In a dictatorial regime, especially a religious one topped with unreasonable “Persian” nationalism like Iran, the education, centred and closely monitored, teaches only dogmatic propaganda. It breeds slaves and hypocrites with megalomaniac ambitions for those who believe themselves to be the elite and cream of humanity. There is, and never will be, a perfect system of government. We are all humans and equally born to be corrupt or decent later in life. Open-mindedness, lucidity and a combative mood for equal rights permit the society to evolve and let the individuals find their place in it, as fragile or as strong as they might be. Dogmatism and bigotry, the core teaching of some orthodoxy, religious or otherwise, command intolerance, and breed oligarchs. The Shiite hierarchy, from the Supreme Guide to the novice mullah, has hijacked politics, power and economic capabilities in our country and brainwashed the youth. I was moved to write Chronicles from Iran because, from the 1970s to the present day, I have witnessed corruption, religious oppression, ethnic persecution, political nepotism and rigged elections, disparity between men and women, propaganda and brainwashing in my country. Unlike its opaque political system, it is clear to see that most Iranians are suffering. I have witnessed this among the people of my own province, who despise the tyrannical regime, but live in a climate of fear and oppression where speaking out can lead to ruthless repercussions. Worse than living with it, is getting used to fear and considering it as a normal condition in people’s daily routines. It follows that self-censorship becomes a cultural characteristic, a reflex of life. I am a Westernised, liberal Iranian. Proud of my Iranian heritage and upbringing in a small town among minorities, with grandparents who stood up to the many faces of despotism, domestic to start with. I was given an unshakeable integrity and ensured I always treated others with respect, and often worked against my own interests. Like some Westernised Iranians, I have also learned from the values of the Western culture, and intend to use them in the Iranian context. These privileged learning experiences have given me an understanding of the strengths and weaknesses of both cultures. It is expressed in this website alongside the views of my fellow citizens who have taken refuge in Europe from the Islamic Republic or stayed in the country, keeping a low profile, almost in hiding, so as to avoid being arrested by the regime’s henchmen any time. The responsibility of the published text is only mine. I do not like the political systems that barb their foreign policies with hidden agendas and loathe corrupt regimes, particularly those that use savagery against innocent people in the name of religion or to benefit a few of their own circle. 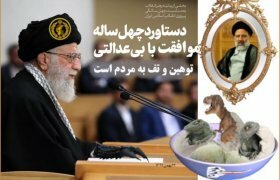 I recognise the failings of the Western world, including the excesses of capitalism and those living only for the relentless pursuit of gain, but I can at least object to that through the ballot box, or voice it; things impossible in Iran under the Vali-e Faqih, and millions of bystanders who silently approve his deeds. 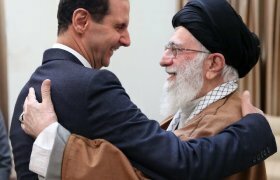 It is evident that the Islamic Revolution in Iran is over and what remains is a social, economic, environmental and political nightmare. Under the continuing theocratic despotism, our country can never hope to secure the future for its younger generations, regardless of their faith, ethnicity and language. However, I believe we can learn from other cultures and work together to bring about free speech and true democracy. Then people of all faiths and cultures can live peacefully and work side by side in building a better Iran. It is a long shot, but well worth trying. Collectively, as Iranians, we have a long way to go before assimilating the constraints on freedom of expression and be ready to accept and discuss the responsibilities involved. The collective conscience of democracy has yet to be born in Iran and be protected and fought for till it reaches a point that it can survive with its own dynamism. It is not an overnight process achieved by individual pompous declarations and paternalism, or something that can be bought and imported. It starts with peaceful and egalitarian debates, if we have the spine for it.